The first Lucy Blue Pizza was opened at 12th and Walnut St. in Cincinnati, Ohio in 2002. 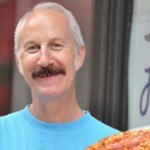 The store was the first pizzeria owned and operated by Jim Thompson, a 38-year veteran of the restaurant business. In addition to making his own dough and sauce, Thompson opened Lucy Blue to be a late night hot spot, staying open until 3 a.m. serving pizza by the pie or by the slice. The concept worked as Lucy Blue was awarded Best Late-Nite Dining in Cincinnati by AOL City Guide in 2005 and 2006, and Best “Meal after Midnight” by City Beat Magazine. With the concept and pizza perfected, Thompson set out to turn Lucy Blue into a multi-store operation. With so many public stories of failed restaurants and little collateral, Thompson faced an up-hill battle to raise the capital he needed to further his Lucy Blue expansion. After he was turned down for capital from his merchant account provider, Thompson was introduced to The Business Backer. After sitting down with Thompson and evaluating the Lucy Blue concept and its financial needs, The Business Backer developed a customized small business financing plan that provided Thompson with the capital loan he needed to buy equipment for his second store. Following the positive experience of the first financing, Thompson returned to The Business Backer for a second time to help finance the completion of his third store. Another time was to help Lucy Blue open its fourth store. All told, Thompson has engaged with The Business Backer on eight different occasions for everything from capital investments to finalizing the financing for further expansion. Today, Lucy Blue has five locations in Greater Cincinnati and Northern Kentucky. With each investment, Lucy Blue has been able to expand and increase sales, helping to better position Thompson for his ultimate goal of self-financing his future growth.